It was discovered a couple of days ago. PUBG, it turns out, isn’t the only battle royale where the fire rate of weapons is seemingly affected by framerates. 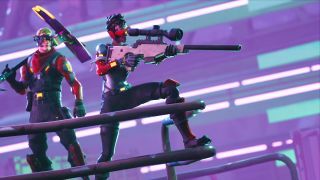 Because it shares an engine with Fortnite, streamer DrLupo decided to run some tests, confirming that the framerate can reduce or increase the rate of fire in Fortnite, too. Epic is aware of the issue and is investigating a fix. This is not the first time the issue has reared its head, however. A Reddit thread from last year goes into a lot of detail about how the framerate affects the fire rate with and without buffs, based on how quickly the magazine is emptied. There are some inconsistencies, and different guns produce different results, some creating wider disparities in the fire rates. What’s clear is that there’s a fire rate cap if you’re playing at 30 fps that results in players dishing out less damage they would at 60 or higher. On PC, the issue is less prevalent because players are more likely to enjoy higher framerates, but players on other platforms, like the Switch, don’t have the same benefits. It will still have an impact on your matches, however, even if it’s a small one, since PC players can still compete with players on other platforms.